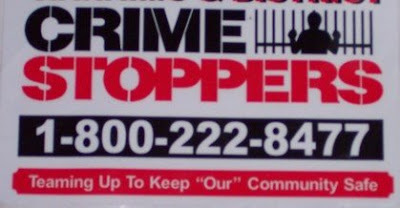 Laura writes, "I got this sticker after donating to the Crimestoppers Fundraising campaign. I feel a little uneasy about it now, as it has made me doubt my place in this community." I wonder whose community is unsafe? The ones in Iraq. I'm pretty sure those communities are unsafe. I suppose the community belongs to the hooligans - well, it did before "Crime Stoppers" showed up.